Rosary beads have now become a very popular fashion item with many celebrities often seen and photographed wearing them. However, their real use is for the recitation of the Holy Rosary a form of meditative prayer used by Christians for hundreds of years. The rosary probably began as a practice by the laity to imitate the Divine Office during the course of which monks would pray daily the 150 Psalms. The laity, many of whom could not read, substituted 50, or even 150, Ave Marias or (Hail Marys) for the Psalms. The Rosary is thought to date from as early as the 2nd century, as ancient graffiti found at some Christian sites seems to indicate. 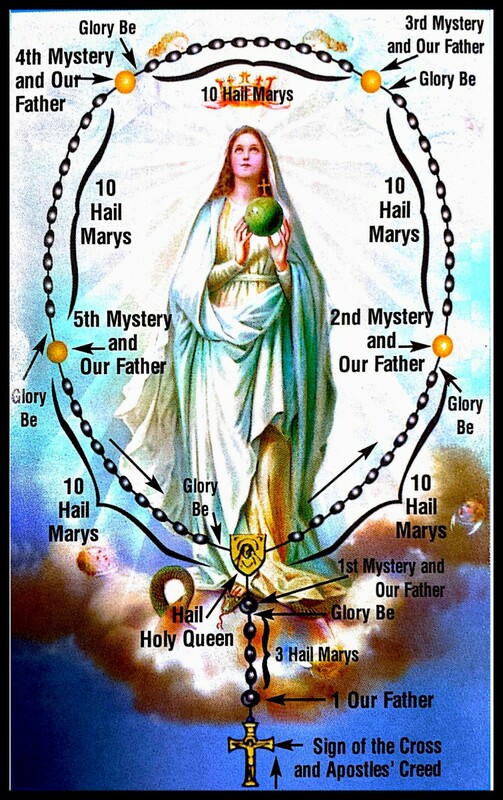 Sometimes a cord with knots on it was used to keep an accurate count of the Hail Marys. The first clear historical reference to the rosary, however, is from the life of St. Dominic (d 1221), the founder of the Order of Preachers or the Dominicans as they are commonly known. He preached a form of the rosary in France at the time that the Albigensian heresy was devastating the Faith there. Tradition has it that the Blessed Mother herself asked for the practice as an antidote for heresy and sin. One of Dominic's future disciples, Alain de Roche, began to establish Rosary Confraternities to promote the praying of the rosary and the current form of the rosary is believed to date from his time. Over the centuries the saints and popes have highly recommended the rosary, as the greatest prayer in the Church has to offer after The Mass and The Liturgy of the Hours. Not surprisingly, it's most active promoters have been The Dominicans. The word Rosary means a crown of roses, a spiritual bouquet which is offered to The Blessed Mary, the Mother of Our Lord. The rosary has been called the preparation for contemplation and the prayer of saints. While the hands and lips are occupied with the prayers, the mind is able to meditate on the mysteries of the Incarnation and Redemption represented by the decades. Meditation is the form of prayer by which the one who prays uses the mind and imagination to consider a truth and uses the will to love it and form resolutions to live it. In this way the heart, mind, and soul of the Christian is formed according to the Gospel examples of the Saviour and His First Disciple, His Mother. In God's own time, when this purification of the heart, mind, and soul has advanced sufficiently the Lord may give the grace of contemplative prayer, that special divine insight into the truth which human effort cannot achieve on its own. Our Rosary Group meets on the second Monday of each month at St Paul's Church, Pontefract Road, Glasshoughton at 7.00pm in the Lady Chapel. Why not come along and join the group. A simply answer is to improve our own spirituality and to grow in holiness. "Among all the devotions approved by the Church none has been so favoured by so many miracles as the devotion of the Most Holy Rosary" (Pope Pius IX). Pope John Paul II called the Rosary his "favourite prayer," after the Mass and the Liturgy of the Hours.